Neem Azadirachta indica, is a tree in the mahogany family Meliaceae. It is the only species in the genus Azadirachta, and is native to India and Burma, growing in tropical and semi-tropical regions. 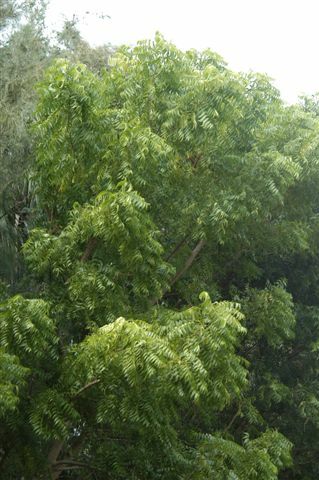 Neem is a fast growing tree that can reach a height of 15-20 m, rarely to 35-40 m. It is evergreen but under severe drought it may shed most or nearly all of its leaves. The branches are wide spread. flowers : (white and fragrant) are arranged axillary, normally more-or-less drooping panicles, bears 150-250 flowers. Neem is more than a tough tree that grows vigorously in difficult sites. Among its many benefits, the one that is most unusual and immediately practical is the control of farm and household pests. Some entomologists now conclude that neem has such remarkable powers for controlling insects that it will usher in a new era in safe, natural pesticides. Neem: A biological insect control product. Neem is not a systemic insecticide as a foliar spray, however it is a long lasting systemic insecticide when used as a soil drench. 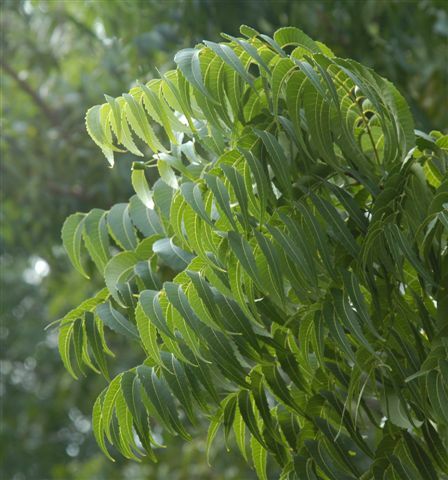 From the neem tree Azadirachta indica, native to India and Burma, it is kin to mahogany and chinaberry thrives in poor soil. It’s a tall tree that resembles the shape of an oak. It produces large white flowers and bears a fruit that’s similar in size and shape to the olive. Extracts of the bitter seeds and leaves as a natural pesticide. It is harmless to humans, animals, and beneficial insects. Pests are unable to build up a genetic resistance which will effect its potency. Neem extracts (the bark is being used in this case) can prevent tooth decay, as well as, prevent and heal inflammation of the gums. It has been added as an active ingredient in several popular toothpastes in that country. Neem is antibacterial, fungicide and antiviral Insect repellent: Neem contains a compound called salannin which biting insects hate. It is more effective at repelling biting insects than the synthetic chemical “deet” which as become the main ingredient of most consumer insect repellents. Insecticide: Neem extracts don’t instantly kill pests. The insects absorb these compounds which block their endocrine systems and disrupt their reproductive cycle. Neem oil and soaps can be purchased from The Ayurvedic Institute, P.O. Box 23445 Albuquerque, NM 87192 at 505-291-9698. This botanical insecticide is extracted from the seed of the tropical neem tree from India. Neem has been in use for centuries for a wide variety of pests. The active ingredient is azadirachtin, which works by preventing molting, suppressing feeding or repelling, depending on the insect. It does not harm humans, birds, plants, earthworms, or beneficial insects. This product is registered for use on ornamentals (registration is pending on food crops) against aphids, whiteflies, thrips, hornworms, mealybugs, leafminers, gypsy moths, weevils, webworms, loopers, psyllids and sawflies. Tests conducted by USDA showed neem extracts to repel cucumber beetles for up to 6 weeks. Neem is most effective against insects, which pass through all stages of metamorphosis. Neem Oil is a thick, ‘fatty’ oil, with a very strong odor. It has been used in India for centuries in most cosmetics and toiletries, etc. Neem oil is strongly insecticidal and can be used in head lice removers. It is rich in oleic acid, palmitic acid, stearic acid, linoleic acid and arachidic acid. It is very moisturizing and used on psoriasis and eczema.